Diseases and conditions of the eye can be difficult to diagnose during your pets yearly examination that is given by your family Veterinarian. As veterinarians who specialize in treating eye problems, our Veterinary Ophthalmologists are better able to examine and diagnose these conditions because the tools he or she has are specific to the eyes. 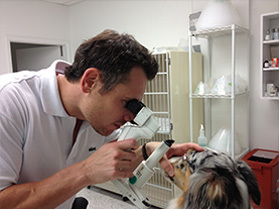 When examining your pet’s eyes, our Ophthalmologists will use a slit lamp. This specialized instrument allows the doctor to see areas at the front of the eye, including the eyelids, conjunctiva, cornea, sclera, iris, lens, and parts of the vitreous. The retina and optic nerve can also be seen when combining the slit lamp with an additional lens. Using this exam, the doctor can microscopically examine the eye for any abnormalities or problems.